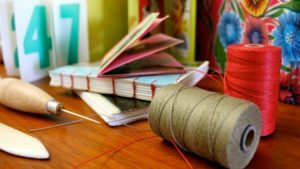 My Do-It-Yourself Bookbinding article has turned out to be one of the most popular articles on this site. It came from my desire to have printed copies of some of the many e-books I have collected over the years. Very often I don’t worry about putting a cover on the book and just bind the pages or I cover the book with plain heavy cardstock and hand-write the title. But what if you really want to put together a polished book that looks store-bought? Take a look at the 3 books in the photo. I won’t make you guess which one I made – it’s the one in the middle! This was my first attempt at creating a cover that would pass for bookstore quality. 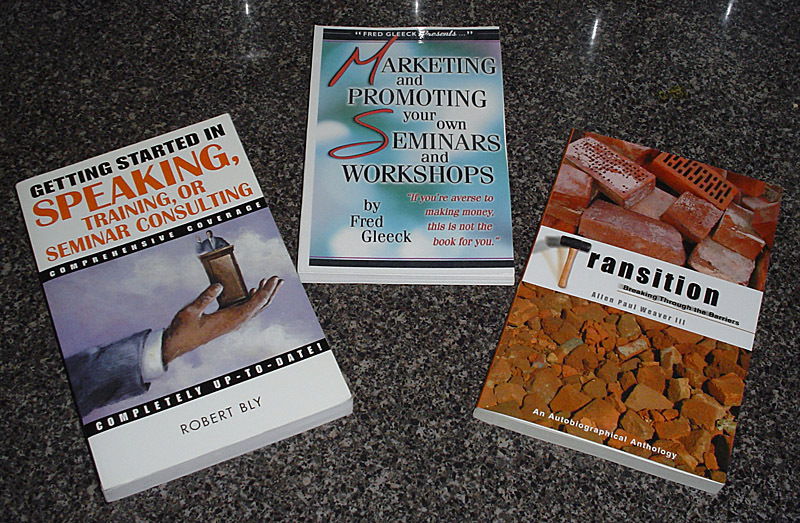 An author I like gave electronic files of some of his books as bonuses for his newsletter subscribers (www.FredGleek.com.) This isn’t a tiny 30 page e-book, but rather the electronic version of a book he wrote for print. It is several hundred pages and I wanted to print it out to keep on the shelf next to 2 other books of his that I purchased. I think it turned out pretty well and I will tell you the simple steps I used to create the cover. When I studied the book covers in my library I noticed that the main feature that differentiated them from plain card stock was the laminated coating that covers on the outside. I don’t know exactly how they coat the pages in professional print shops, but I figured that a simple thin coating of adhesive laminate would give a very similar result. My main goal was to protect the printing and make the cover water resistant and give it the glossy sheen of a trade paperback. I laid out my cover in Photoshop, setting the page dimensions to match my paper. This time around I didn’t try to print on the spine or back cover – just the front. This choice saved me a lot of measuring and tweaking. If you want to wrap all the way around, measure the thickness of your book block and make your page size equal to twice the page width plus the spine width. Then, lay out your cover text and art. When printing, make sure your printer is set to print the whole page edge to edge (most new photo quality printers are capable of this.) If you can’t print edge to edge, make sure that Photoshop does not scale your image to fit the page – this will throw off all of your measurements. If your cover has full-page artwork, set the page dimensions to have an extra 1/4″ on the outside edges of the cover. You can trim off the extra when you are done and there will never be a white edge where your graphic stops. When the cover is printed, cut a length of laminate off of the roll that is a little larger than the cover. Peel off the backing paper on one end. Next, stick that edge to your working surface and then peel back the rest. This will help you to hold the laminate straight and tight as you press it onto the cover. Position the cover underneath and then slowly press the laminate onto the page and smooth out any air bubbles. Work from the center out. Press the laminate down firmly over the whole cover to ensure solid contact. Next you will need to crease the cover where it will bend around the spine. Line your straight edge up in the spine of the book and use your bone folder to score the spine. Fold the cover along the score and you are ready to glue it to the book block. Apply a layer of glue to the inside spine of the cover and then set the bookblock in place. I tap the spine on the table a few times to force the book block firmly into the glue and then leave the book on on its spine until the glue dries. When everything is dry, take your Exact-O knife and straight edge and trim the excess paper from the cover. You should have a pretty professional looking book at this point. I went an extra step and had my local copy shop trim the 3 open edges with their heavy duty trimmer. This was a little expensive, but I wanted to see how good it could look. This technique works equally well for saddlebound book covers. 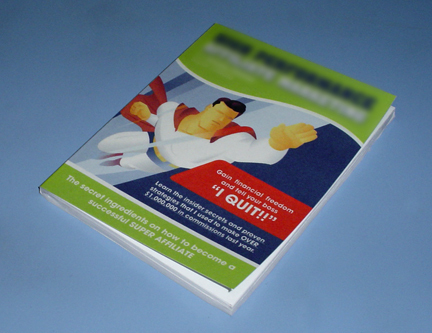 Just buy cover stock that is exactly the same size as your pages, ignore the spine in your design, and fold down the middle when you staple the booklets together. Another variation to try is using heat activated film rather than peel-and-stick. I’ve found that the press on film can de-laminate over time and needs to be pressed down again and again. This is not a big deal for personal projects but will look bad if people paid for the book. Heat-set laminates adhere better than the peel-and-stick kind. I don’t have a heat laminating machine (and they usually require you to put film on both sides at the same time – so you will have to laminate 2 covers at a time and then cutting them apart once laminated.) This is why I chose the press on film. When brainstorming for another way to apply heat set laminates, I remembered that when I used to build model airplanes we used to use a little iron to apply a heat shrink plastic over the frame. If I get a roll of heat-set film, cut it to size, and apply it with an iron, I should end up with a sturdy cover that doesn’t require me to fight with the peel-and-stick adhesive! This is a project for another day. One final idea I had for covers (this goes back to my art school days) was to get a spray fixative from the art/craft store and spray the printed covers instead of laminating them. This doesn’t provide the feel of a laminated coating, but it will offer better water resistance and give a sheen to the surface of the cover. Some sprays will not remain flexible when dry and will flake and peel when the book is handled. Make sure to test before committing to a large production run. If you have any tips or techniques that you use to make trade paperback style covers, leave a comment and share your wisdom. Also, let me know why you are interested in binding your own books. The more I know about what you are trying to do the more helpful I can be with my tutorials and suggestions. I was looking for self-binding information for a single use. Your site was helpful. What sites did you find where you could make planners and notebooks? That would be very helpful. We’re glad you found the info here helpful and appreciate the feedback. You’ll find templates, tips and tutorials that rival the work of any prefab planner system you’ve ever seen. If you don’t find what you need there, check out http://www.lifehacker.com. Search their archives for planners and you’ll find tons of posts with recommendations of other high-quality sites. I do have a heat-activated laminating machine with laminating film pockets. If you put a slightly larger sheet of paper behind your cover stock in the packet, you can laminate it, then trim off the edges and the back laminate would adhere to the other sheet and the cover stock would be laminated on the front only. Thanks for the tip. That sounds like a good way to manage using a heat binder to laminate the covers. Another idea I’ve learned since writing this tutorial is to laminate covers in pairs. You print out 2 covers and place them back to back. Then you slip the pair into the laminate pouch and run it through the machine. When the machine is done, you trim the edges of the cover to remove the excess laminate and separate the covers. You are left with 2 covers laminate on one side. I haven’t had the chance to try this yet, but it seems like a good approach if you print multiple copies of your books. I’ve bound quite a few books by hand and really enjoy the process. In my efforts to achive a high quality look for the cover, I’ve used many variables. The thing that I’ve found works for me is Polyurethane and Krylon spray. I buy the polyurethane (in the black can) from Home Depot or Lowes and the Krylon from Staples or a Kraft Store. Staples has a MATTE finish photo paper that produces a photo quality print from an inkjet printer. I bleed it using the bleed option from my printer. The problem I was having was making it waterproof and fingerprint proof. Hence my experimentation. After I print it I spray it with the polyurethane and let it dry. (approx. 5 minutes) — Then I spray it with Krylon. Let dry. (approx. 5 minutes) I use the “high gloss” — I repeat the process with the Krylon about 3-4 times to achieve the look that I want. What it gives me is a really nice, water/fingterprint proof cover. It looks almost like the matte finish books you see in Barnes and Nobles or other book store. The important thing is to make sure when you spray that you cover the entire area and that you do not spray it too heavily. If you spray to heavily it will leave a mark. I’ve been very happy with the results. In fact, I’ve had several people tell me that you cannot tell the difference between my copy and one from B&N. I’d really love to hear from any of you that try it and what results you’ve achived. How durable are these covers? Does the coating crack or flake of with repeated bending of the cover, or does it remain flexible? Either one can take weeks to stop stinkin’, and are prone to cause the stock to curl (due to to the difference in moisture absorbency on the uncoated side…both work well otherwise, just keep this in mind. Thank you Very Much for sending me a latte for this article. I’m glad you found the article valuable and appreciate the support for my work and this site! This is a great information. But do you know where to buy the perfect paper and cover paper to create a book? Do you have it for sell? I just get my paper from Staples. I use card stock for covers and a heavy bond laser paper for pages. Thanks, this site is very informative! I’m working on a book that I want to print out with full 8.5″ x 11″ pages. Where can I find cardstock large enough to do a wraparound perfect bind cover? The largest card stock I’ve found is 11″ x 17″, which isn’t large enough with spine taken into account. If you have a cover designed that you want to print all the way to the edges of the paper, you need a printer capable of ‘borderless printing’. 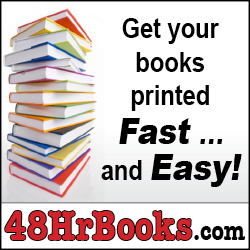 Otherwise, you should plan on printing the cover larger and cutting it down or trimming the entire book down after it is bound to clean-up the edges. I am in the process of finishing my book and decided to self publish.What paper is better for paper back covers? Coverstock (glossy),Cardstock,or Bristol Paper?Do you know if HP Photo Smart computers can do the printing for the cover? Personally, I use card stock and apply a 3mil laminate to the outside after printing. If you can do a borderless print, you should be able to work out settings to get your printer to properly output the cover you design. I’ve found that when you use a laminating machine, place two covers the same size back to back. Run them both through the laminating machine. When they are laminated, simply cut around the edge and they separate into two covers that are laminated only on the outside. A consideration about this: make sure your paper grain is running parallel to the spine, otherwise the cover will curl from the outside corners to the center when the book is bound. You are spot on with how to best laminate covers with a hot-laminating machine. I think I mentioned something similar in an earlier comment, but it’s easy to miss and worth repeating. Your note on paper grain is also right-on as well. The struggle is that when binding a book we tend to turn paper 90 degrees from how it is commonly used. This means that most paper readily available is cut with the grain running in the wrong direction for our needs. One solution is to buy large format paper and cut it down with the grain running in the proper direction. But, that adds a considerable amount of labor to the process. So, for a casual bookbinder like me, I just accept some page curling. For others, it’s worth a little extra effort. Now, if you know of a source for affordable pre-cut paper with the grain running in the right direction, please share it. I would love to be able to improve my books by simply ordering better paper. I’ve been a heat pouch laminator for more than 15 years. With that came the creative challenges of thinking outside the box and playing by my own rules. Many of the suggestions here using a heat laminator but doing just one side of the paper are quite good. You can also purchase so cheap it’s hard to believe single roles of lamination material for heat laminating. Withthat you can cut your own pouches of sorts. You can also find less then 3 mil weight. You can get specialized UV protective films. Matt and glossy and write on surfaces. Most films can be written on with some pens. Anyway if you use a pouch style laminator and want to laminate the outside cover only you could cut the pouches apart and lay directly over the cover or place a sheet of lamination over the cover and then using a special folder that keeps your laminations from being eaten by the machines rollers you can be successful. Try it on a just to fit size or larger cover stock then the lamination sheet itself. I personally am trying to do thinner laminate about 1.5 on both sides of the cover for a special photo book where I have photos on the inside too. The next challenge well be to laminate the inner book pages using photo paper instead of text paper and see if one can glue it up and hold it together with a cover. One problem with the use of single sheet of plastic is it loves to curl. The file carriers help a lot with this as does a bit of tape or ironing down a corner or two using one of those small craft irons. Always think outside the box. How thick is the cover paper that you use and how many lbs? The cover stock that I have been using is a Hammermill 67lb Bristol Cover Stock. I’ve been pleased with the feel and durability of the covers. When combined with a .3 mil laminate layer, it is just about perfect. Nice site! Ran across it while looking for info about self-publishing (or, more ambitiously, publishing in general). Just a quick note about laminating the covers: you mention that you don’t know how they professionally laminate (or “gloss”) covers–nor do I, by the way (if I knew this stuff, would I have wandered over here? lol)–but I think there’s plenty of evidence that they’re sprayed in some fashion. One definite indication of that is the occasional “missed spot” you’ll run across (at least if you hold it up to the light) on a paperback cover or book jacket. An even better indication, though, is the fact that eventually the gloss wears off. This is noticeable in paperbacks; it’s absolutely notorious in comic books!…so much so that, when collecting was first becoming a serious hobby back in the early 70’s, many people were of the opinion that so-called Golden Age books from the the 40’s weren’t glossed back then. But then a few really well-kept old collections came to light which had been immaculately preserved, and darned if the gloss wasn’t there! Seems to me that a laminate might peel, but it wouldn’t wear off, whereas a spray would. On the other hand, I have more than a few older paperbacks in my library on which, indeed, there’s a layer of laminate peeling at the edges, so I suppose it’s done both ways, or perhaps used to be done one way and is now done the other (though why, if they’d been spraying comics all those years–and I’ve never seen a comic “peel”–would they have chosen an alternative method for the paperbacks? Hmmm…). At any rate, it’s been a long time since I’ve run across a paperback that was peeling, but then I’m taking care of my newer books better than the people who owned the older ones before me, I guess. I’m glad you like the sites and I appreciate your insights about covers. A few years back I worked with a graphic novel publishing group and remember them making a cover that had one glossy spot in the middle of the front . They referred to it as lacquer (spot lacquer to be precise.) 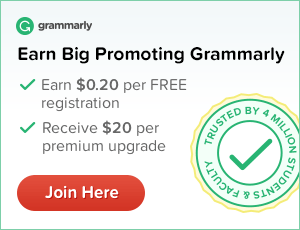 I recall it being an expensive option – not sure if that was due to the material or the process of applying it to a specific area of the page. I can’t say if the coatings on other cover stocks is the same, or if some type of lamination process is used. I’ve read a few bookbinding patents that mention lamination as a step in the process, so I’m sure somebody does it that way. As for the glossy paper, that is a clay-coated paper in most cases. That’s one reason the paper is much heavier than other paper types. Thanks for checking out the site and joining the conversation. Many of the papers today are actually plastic based and some plastic coated. Some are quite unique even translucent. Years past laminating wouldn’t in all cases refer to plastic. Wood even can be a laminate. Clear cover coats such as lacquers may have been spread on sprayed on or even dipped on…maybe even other techiques. I’ve got several interesting plastic covers with embedding and embossed textures and printing into them. I am interested to see how they age and if they become brittle with age which some plastic has a tendency to do. I’m a newcomer to your web site. First of all, I want to say thank you for all the information I have already picked up from you. Secondly, I want to buy some of your books but want to buy either hard copies or ebooks. So far I’ve only seen your books for sale on Kindle. Lastly, I’m living in rural Ireland so can’t go to e.g. Office Depot or Lowes etc. Can you recommend any web sites so I can buy materials on line? The only bookbinding publication I currently have (DIY Bookbinding Jig) is available as a PDF ebook as well as a Kindle publication. You can use one of Amazon’s free Kindle Reader apps to read Kindle books on almost any computer/tablet/smartphone available too.